^ "Документ о награде :: Солженицын Александр Исаевич, Орден Красной Звезды" [Award document : Solzhenitsyn Aleksandr Isayevich, Order of the Red Star]. pamyat-naroda.ru (in Russian). Retrieved 28 April 2016. ^ "Dmitri Turin". Orlando Sentinel. 24 March 1994. Retrieved 19 August 2016. ^ Morrison, S. (1 February 2010). "Rostropovich's Recollections". Music and Letters. 91 (1): 83–90. doi:10.1093/ml/gcp066. ISSN 0027-4224. ^ Kriza, Elisa (1 October 2014). 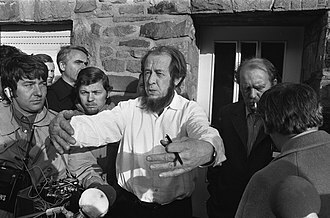 Alexander Solzhenitsyn: Cold War Icon, Gulag Author, Russian Nationalist? : A Study of His Western Reception. Columbia University Press. pp. 205–210. ISBN 9783838266893. ^ Савельев, Дмитрий (2006). "Узловая элегия". In Аркус, Л (ed.). Сокуров: Части речи: Сборник [Sokurov: Part of Speech: Collection]. 2. Санкт-Петербург: Сеанс. ISBN 5-901586-10-7. Archived from the original on 4 October 2011. ———; Melchin, SA; Stepanov, AS (1995). Scammell, Michael (ed.). The Solzhenitsyn Files. Catherine A. Fitzpatrick (tr.). Chicago: Edition q. ———; Struve, Petr Berngardovich (1986). Woehrlin, William F (ed.). De Profundis [Out of the Depths]. William F. Woehrlin (tr.). Irvine, CA: C Schlacks, Jr.
———; Bulgakov, SN; Gershenzon, MO; et al. (1977). Shragin, Boris; Todd, Albert (eds.). Landmarks: A Collection of Essays on the Russian Intelligentsia. Marian Schwartz transl. New York: Karz Howard. ——— (November – December 2002), "Solzhenitsyn on Russia's 'Jewish Question", Society, pp. 104–09 . Pogadaev, Victor A (October – December 2008), "Solzhenitsyn: Tanpa Karyanya Sejarah Abad 20 Tak Terbayangkan" [Solzhenitsyn: Without History of the 20th Century His work Unimaginable], Pentas (in Indonesian), Kuala Lumpur, 3 (4), pp. 60–63 . 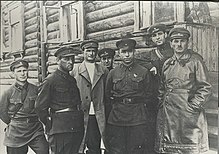 Solzhenitsyn, Aleksandr; et al. (1980). Berman, Ronald (ed.). Solzhenitsyn at Harvard: The Address, Twelve Early Responses, and Six Later Reflections. Washington, DC: Ethics & Public Policy Center. ——— (1975). Dunlop, John B; Haugh, Richard; Klimoff, Alexis (eds.). Critical Essays and Documentary Materials. New York & London: Collier Macmillan. ——— (1985). Dunlop, John B; Haugh, Richard; Nicholson, Michael (eds.). In Exile: Critical Essays and Documentary Materials. Stanford: Hoover Institution.